He is fat, pink, and has an adorable snout. He has everything you are looking for in a pig. But by the end of this short film, you will surely contest that Ormie the pig is more than just delightful and charming written all over him. For the whole length of the short, watch Ormie as he launches numerous attempts in pursuit of his love � a jar filled with cookies. And what does a pig got to do in the face of food? Take it down and gobble it. It is not that easy a task; but, Ormie is not your ordinary pig in a pen. 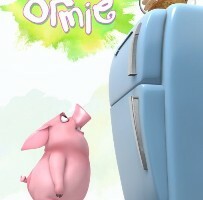 In more than three minutes, the creator of Ormie highlights the pig�s movements to reach his most wanted cookies in several comical ways and failing each he does so. Each of these attempts is presented one right after another � in a very quick pace � maintaining the humor from start to finish. A smile � at the very least � is guaranteed not to leave your face for the whole length of the short film. Also, Ormie�s was shown to have movements exhibiting his agility and speed � one may actually wonder his eligibility as a pig. So free that kid in you and indulge even in just a few minutes of childlike laughter.